Pozole is a soup usually made with hominy, pork meat, spices and fresh garnishes that create a wonderful one bowl meal warm soup. 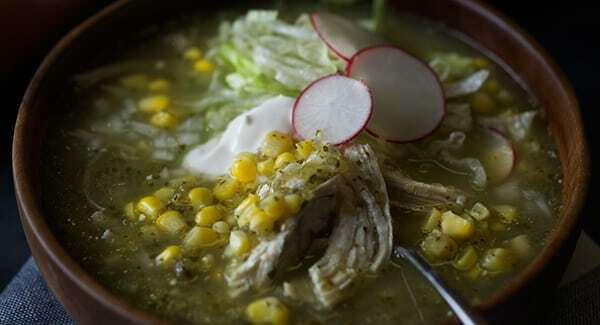 Let’s say Pozole Is kind of the Mexican Pho. 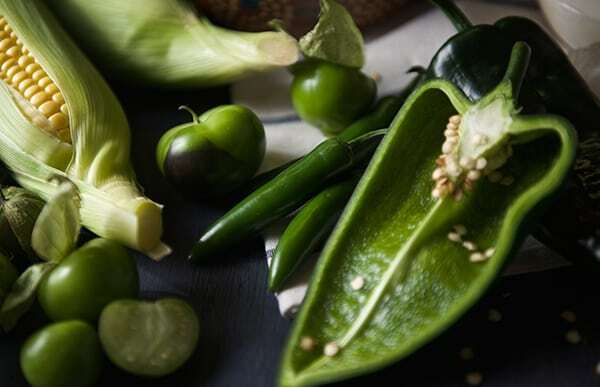 There are a couple of variations upon regions and availability of ingredients, red chiles , green tomatillos and poblanos, or just garlic and onion. There’s even not so traditional versions using chicken or turkey to make the soup a little lighter and healthier; even vegetarian versions using button mushrooms instead of meat, in my opinion all equally delicious in its own way. Another variation on this dish would be the fresher version also known as ‘Pozolillo’, that uses fresh white corn in the cob kernels like in Michoacan and Guerrero. Which is the version I prepared. The hominy used in Pozole is freshly made from dry kernels that are transformed into ‘nixtamal’ this process involves soaking the dry corn kernels in water and limestone to burn and cook the skin. 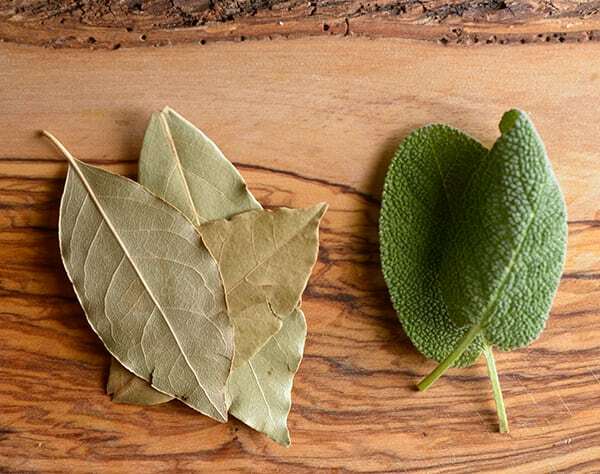 It is an intense preparation more commonly used in the South of Mexico, Sinaloa, Jalisco, Michoacan, Guerrero, State of Mexico and Distrito Federal. While in the norther mexican states like Sonora, Monterrey, Chihuahua, the proximity with the border has a not so preferred commodity, hominy on a can which to my taste is hard to equal the good flavor from the freshly made. 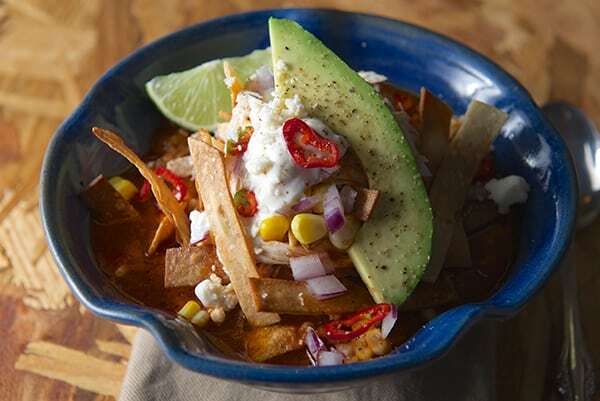 Despite the regionalism, Pozole is a classic soup among mexican families, every family has its own recipe and a style; whether is white, red or green, a grandma, sister, mom or aunt who makes it; It is always a great comforting meal that brings family and friends together. In my family, My Grandma, from my father’s side is my Pozole Guru. She will start to cook the Pozole two days in advance by soaking the dry corn-nixtamal with a bit of lime stone to lose the skins on the kernels, rinse it infinite times and slow cook it for a couple of hours. Grandma Mago used pork shoulder and very meaty pork cuts. Her Pozole was white, meaning she would not add any chiles to tint and flavor the broth, the flavor came from the cosmic union of the extremely well prepared artisanal hominy, tender pork, garlic and onion. Amazing, simply amazing. On the other side of my family, the Pozole Guru is my Aunt Paloma, she makes the BEST Red Pozole. 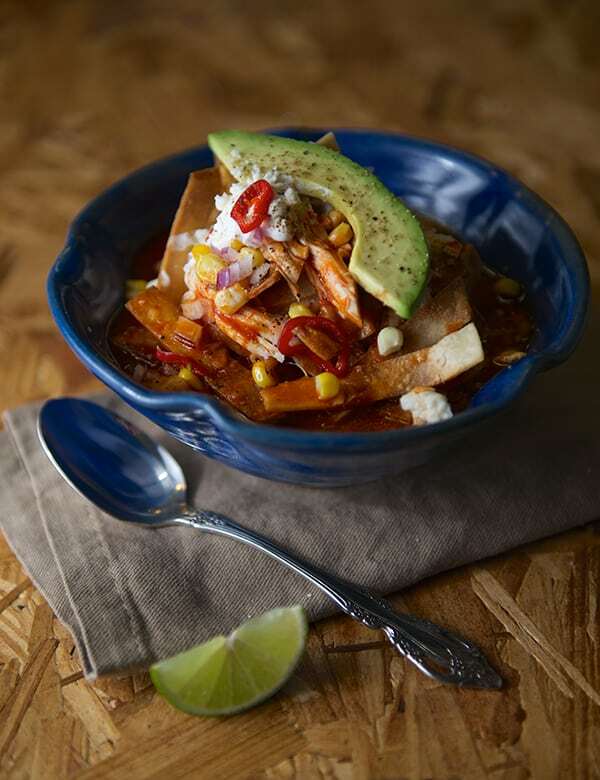 Absolutely delicious, she uses also pork and red chiles like ancho and guajillo which are very mild chiles that flavor the broth transforming it in this aromatic and savory broth you almost want to use a straw to drink it. Scrumptious. As you can see I have a mayor task here, So far I’ve cooked both Pozole styles, white and red, I love them equally. And yes, it is the cook hand, what we call “sazon” that makes a dish your dish and the only way to exceed at it is practice, practice and more practice my little grasshopper. This time I’m attempted to recreate a Pozole Verde or Pozolillo. First time I had this green gem soup was at a friend’s house she was from Michoacan. I inmediatelly fell in love. This Pozole Verde is made with white corn kernels instead of hominy and uses tomatillo, serrano and poblano peppers to flavor the broth. What is so special about it? 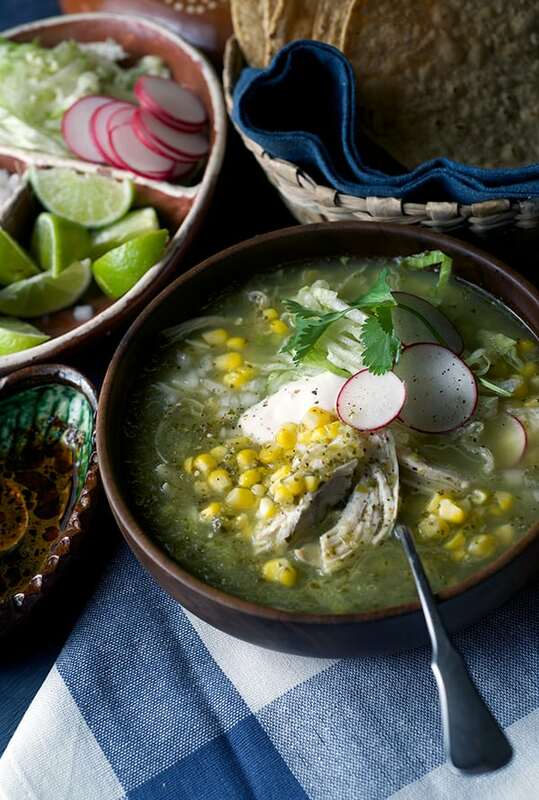 the broth in this Pozole Verde It’s light, fragrant, almost has a herbaceous flavor, and the green tomatillo adds a bit of a thickness to the broth without making it heavy to the palette. 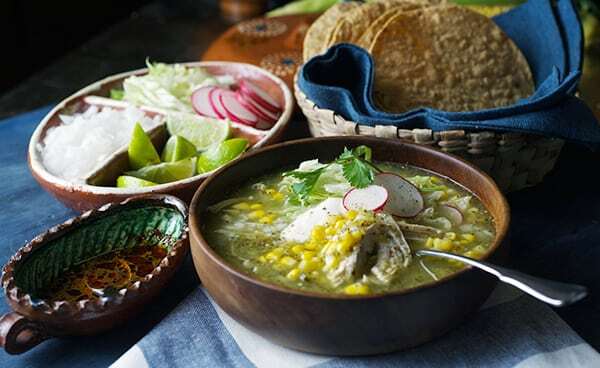 The corn kernels make this Pozole a great fresh taste, really unique and very achievable if you lack of a mexican Grandma, Aunt or good quality hominy. 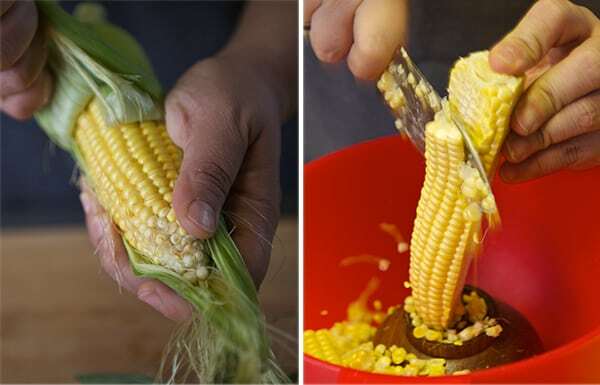 In this recipe, I used sweet corn. Why? Well, Ian is more familiar with the corn flavor than with the hominy. Not a lot of people likes hominy and I strongly believe is because what they have tried is from a can. So what you do? What did I do?..I used what I had freshest available. This week I ran into a good corn sale at the market, it was fresh and tasted sweet, juicy and crunchy good enough to make it into a soup. Now, I know some people will crucify-me about using sweet yellow corn but, I have to say that the variation came out tasting really good. 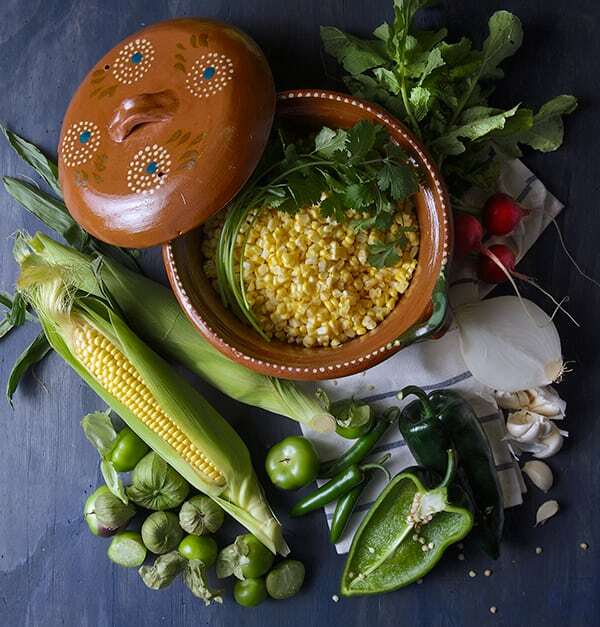 Do your best with what you have, use what is freshest available to you, if you find white corn this will be my first option, and if you prefer Hominy, I will encourage you to find “Rancho Gordo hominy”. Last option will be Juanita’s Mexican style hominy. Yes this particular brand has the best texture, and 3 ingredients, water, hominy, lime stone. Making it the best option. If can is the only option you have, this will taste good. Any how, easy recipe, one pot wonder, it keeps really well, I have not attempted to make this Pozole Verde on a crock pot, I see no reason why not you could use it. Please, if you do, let me know how it goes. Keep warm and EAT your SOUP, do not lick the bowl, use a straw!. Serves 4 Mexicans 6-8 Green coats. 3.5-4 lbs. Whole chicken or the meat of a roasted chicken shredded. 3 poblano peppers remove seeds and deveined. Toast in Oil about 14-20 dry red chile de arbol, until they have this mahogany dark color, remove from heat, add 2 garlic cloves cut in half and a good pinch of sea salt. Blend all this until a coarse puree. Add a dash of dis paste when ready to eat.The heat in this sauce-paste is mild, due to the toasting of the chiles, it makes it smoky and mild heat. 1. In a large pot add 8 cups of water ½ medium onion, ½ teaspoon oregano, ½ head of garlic ½ bunch of cilantro, 2 bay leaf, 1/2 teaspoon dry thyme, 2 carrots, 1 sprig of celery, 2 teaspoons sea salt. Add the whole chicken, skin on, cut in pieces, for faster cooking. Bring to a slow simmer; with a ladle remove the white foam that forms as it cooks. Cook for about 35-45 minutes. Until chicken is tender. 2. Once the chicken is cooked, Remove the chicken, herbs, onion, garlic, sieve the broth. 3. Let the chicken to cool down until riches a comfortable temperature to remove the skin and shred the chicken meat. Set aside. 1. 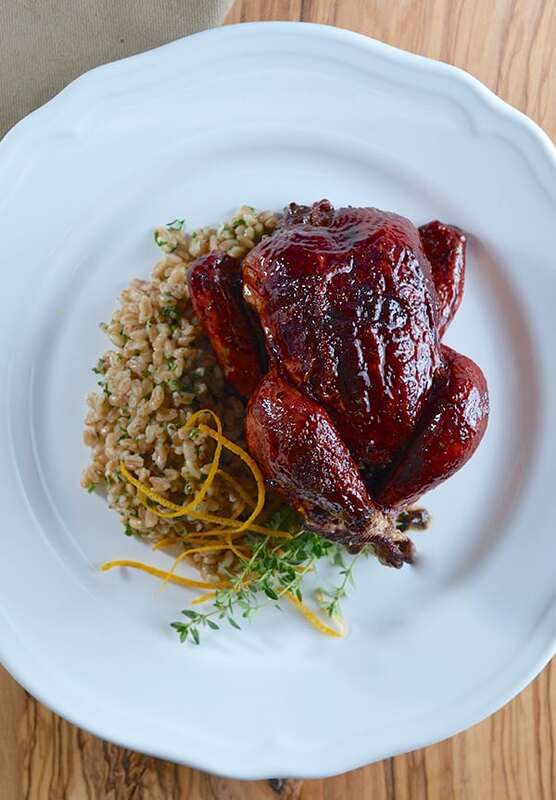 Remove skin from roasted chicken and shred. 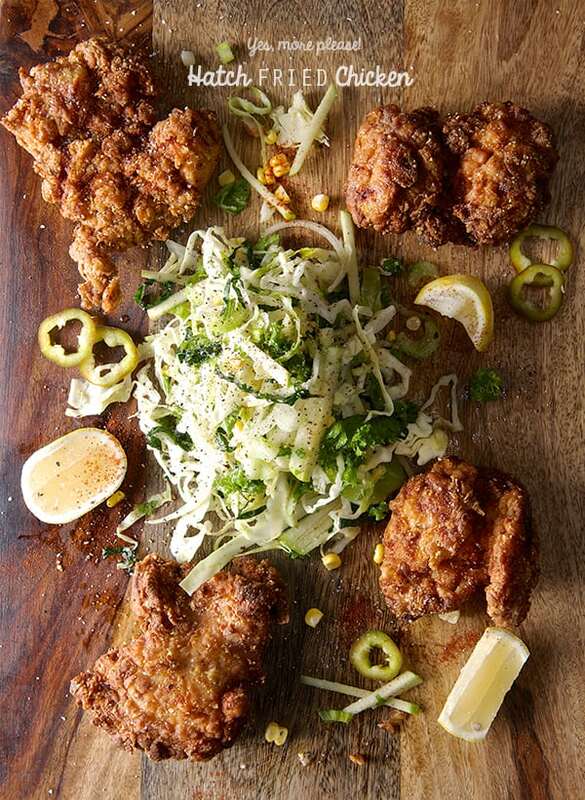 Save the chicken carcasses and set aside. 2. In a large pot add 8 cups of chicken stock, ½ onion, ½ teaspoon oregano, ½ head of garlic ½ bunch of cilantro, 1-2 teaspoon salt and the chicken carcasses from the roasted chicken. 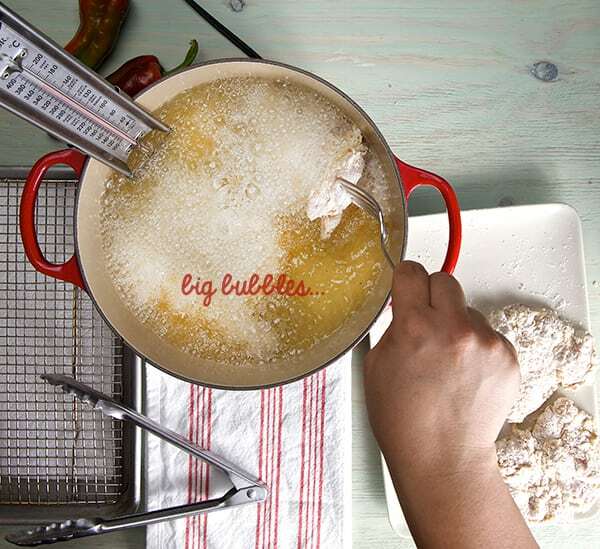 Bring to a slow simmer; with a ladle remove the white foam that forms as it cooks. Cook for about 20-25 minutes. 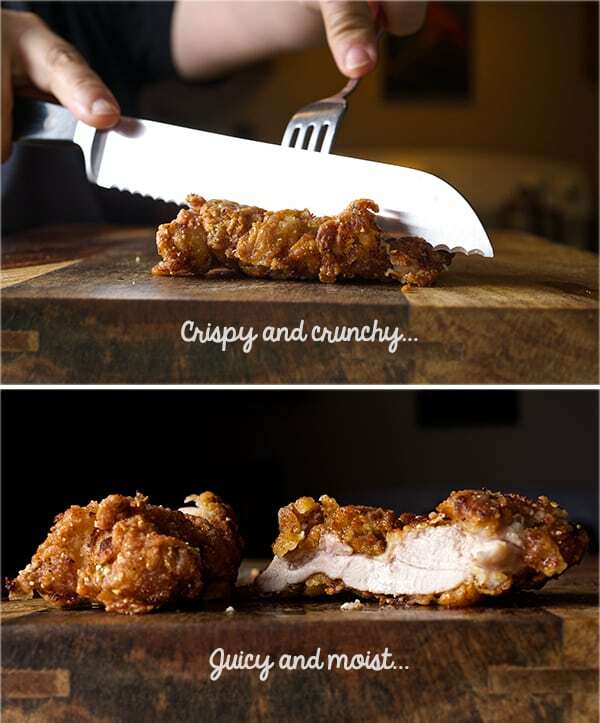 Until chicken is tender. 3. Once the chicken broth is seasoned and cooked, Remove the chicken carcasses, herbs, onion, garlic. sieve. 4. 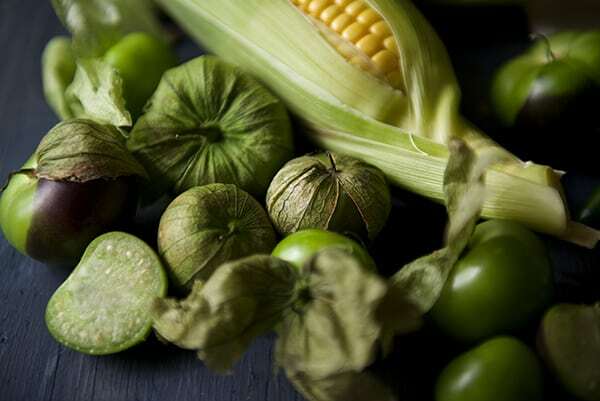 Remove the tomatillo husk, wash them and cut in halves. Cut poblano peppers in half remove the green veins, and seeds. 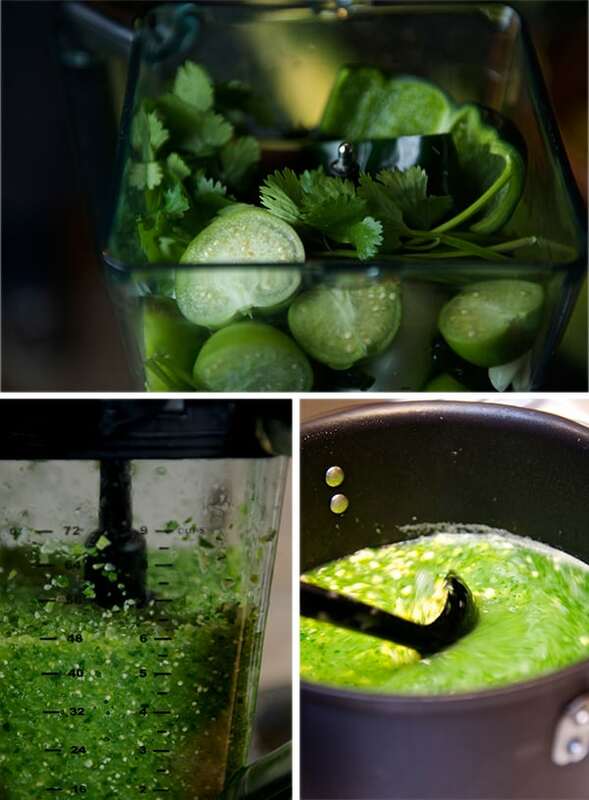 In a blender add the tomatillos, poblano peppers, the other ½ onion, 3-4 garlic cloves, the other ½ bunch cilantro, salt, 2-3 serrano peppers. 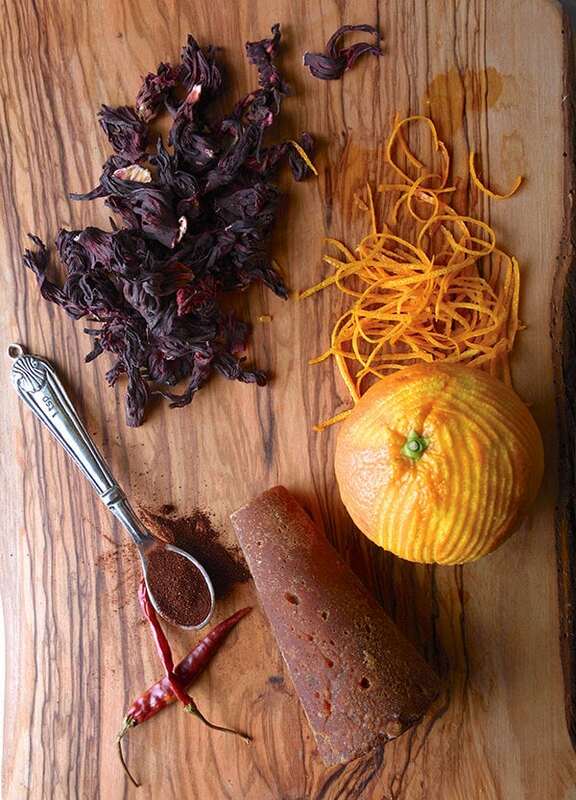 Add one serrano at a time and taste in between blending so you can measure how spicy it is. 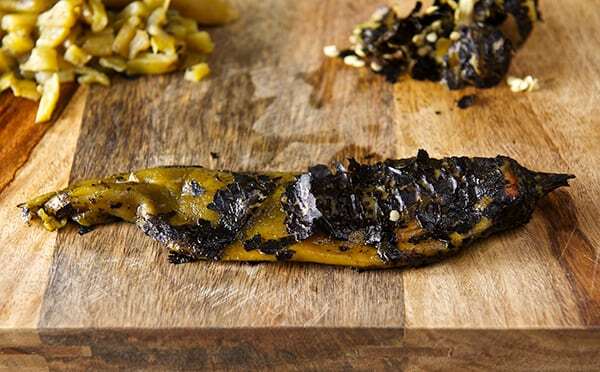 The serranos in this recipe are used to add flavor not spice, they act like black pepper. Add a little of the chicken broth from the pot to help blend all this. Blend until is pureed. 5. On a large deep pot add 1 tablespoon sunflower oil until oil is hot. Add the tomatillo blended sauce to the oil and cook for 5 minutes (careful it will splatter). Now that the sauce is sautéed, add the 8 cups of chicken stock, along with corn kernels. Bring to a slow simmer. Cook for about 25-35 minutes.The broth will change color from emerald green to a bright sage green. At this point taste to adjust for salt. Add your shredded chicken to warm through. 7. Serve piping hot and garnish with shredded lettuce, chopped onions, slices of radishes, squeeze of lime and a dollop of crema. Enjoy! 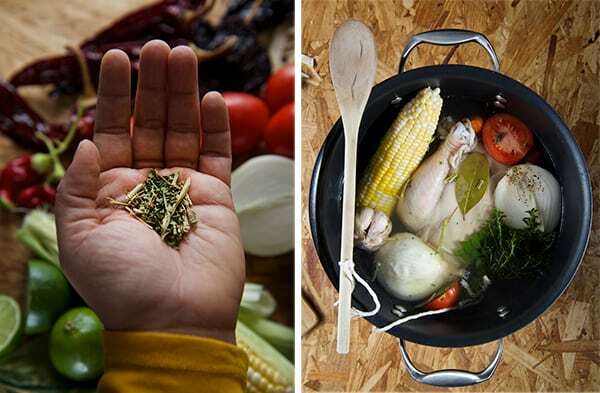 One of the dishes that can be found in almost every culture is chicken soup. Chicken dumplings, Chicken noodle soup, Mexican Caldo de Pollo, Avgolemeno (Greek) , Penicillin (Jewish), Kerala (Indian), French using aromatics and herbs, German creamy chicken and potato soup. You name it, Chicken soup is the queen of soups. 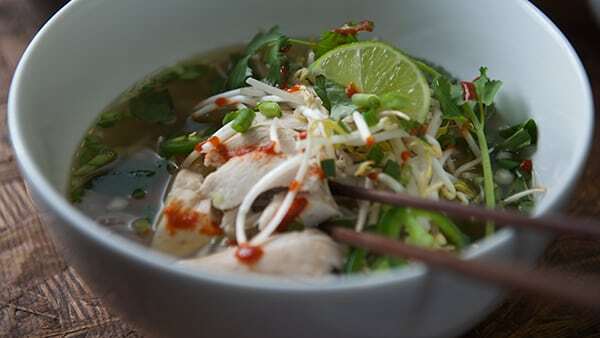 Vietnamese cuisine features one favorite chicken soup, Pho Ga Vietnamese Chicken Noodle Soup . This cosmic broth can bring the use of all your tastebuds at once. 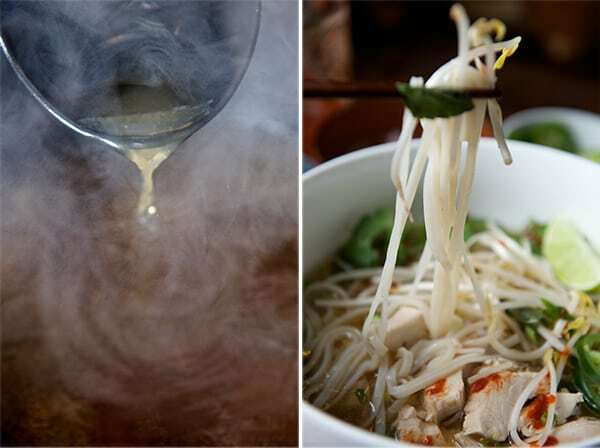 There are two styles of this soup; Pho from Hanoi- phở bắc or “Northern Pho” and Saigon Pho-phở Sài Gòn from the south, both have two ingredient variations. Pho Ga (Chicken), Pho Bo (Beef). Hanoi Pho uses a wider noodle, lots of green onions, vinegar and spicy chilies to garnish the dish. 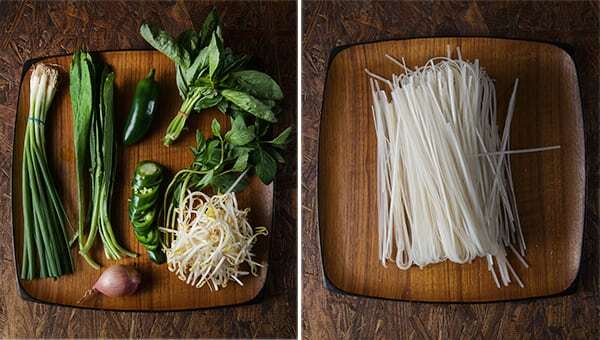 Saigon Pho uses a thinner noodle. The broth has lots of aromatics and slightly sweeter taste. 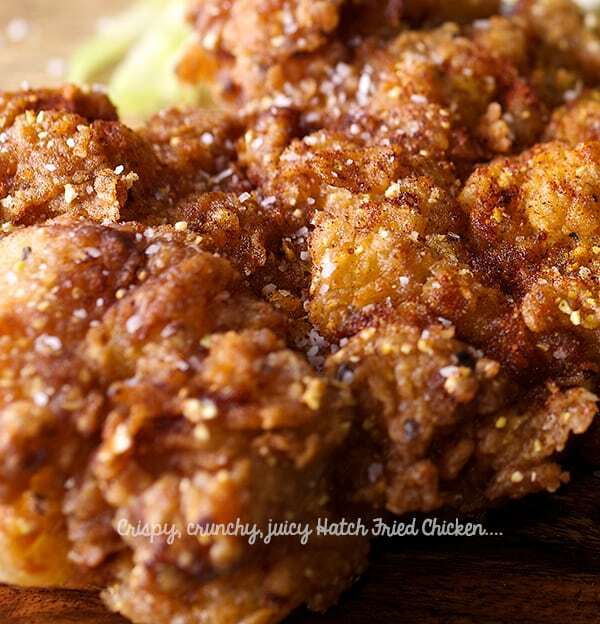 For garnish they use a wide variety of fresh herbs, soy bean sprouts, lime, and chilli “rooster sauce” (Sriracha). Saigon style is the one I’m more familiar with. I’ve made a little variations on this recipe. 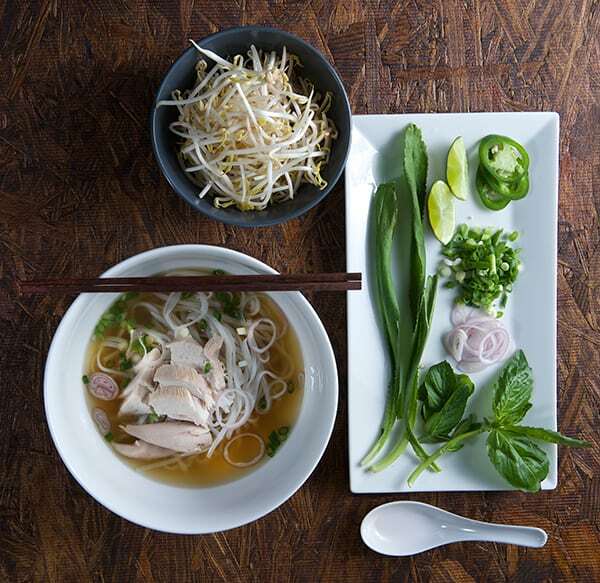 Usually Chicken Pho “Pho Ga”is served with a clear broth flavored with charred onion, ginger, and coriander seeds. While the Beef version “Pho Bo” the broth has notes of cinnamon, cardamom, star anise, and of course the flavor of roasted bones intensify the broth. I added a few more notes to my chicken broth to accent the chicken flavor and give a little more depth of flavor. I hope you enjoy it. 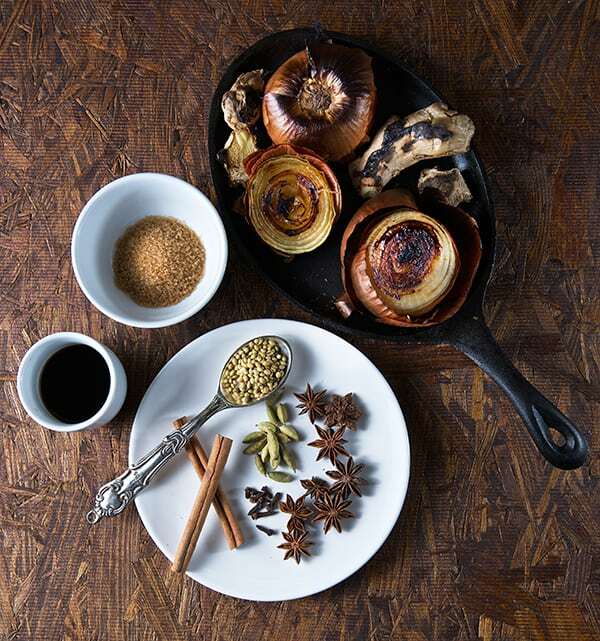 I think it is a fantastic dish, light and great for January with its cold weather. This would be a good recipe for a weekend since it requires a couple of hours worth of preparation and cooking. 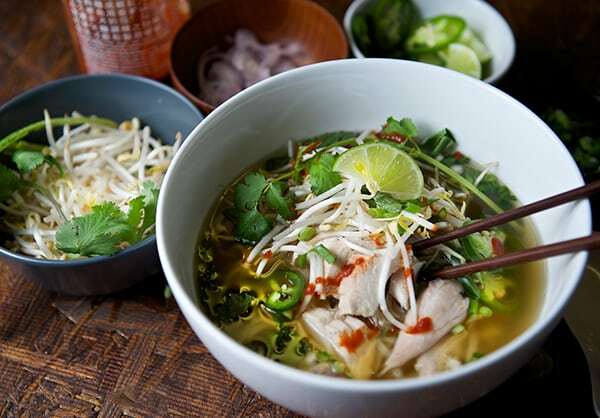 Now with all the big holiday dinner parties and big calorie dishes gone, I’m craving lighter dishes with a punch of flavor and fresh herbs or vegetables, Pho Ga Vietnamese Chicken Noodle Soup is my cosmic route. 2-3 lbs. extra chicken parts like wings, backbones, neck or any other bony chicken parts. 1 piece of cheese cloth and cotton string or a large tea ball. or 1 shallot thinly sliced. 1. Rinse the ginger pieces with the skin on and cut the onions in half leaving the skins on. 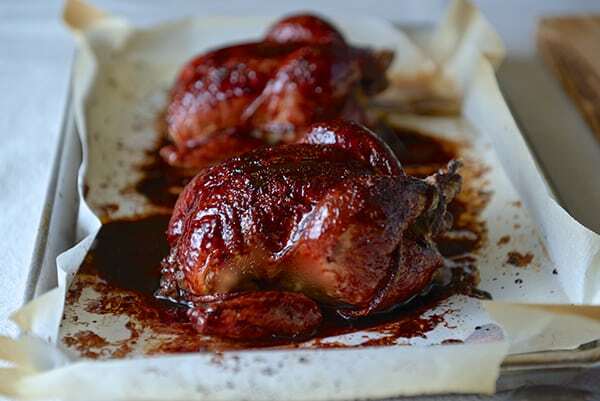 Place them in a cast iron pan and roast them in the oven at 450F/230C for about 15-20 minutes. Broil them for 2-3 minutes to charred the outside. If you have a gas stove, use direct flame until well charred. Set aside to cool them and peel and remove the ginger and onion skins. 2. 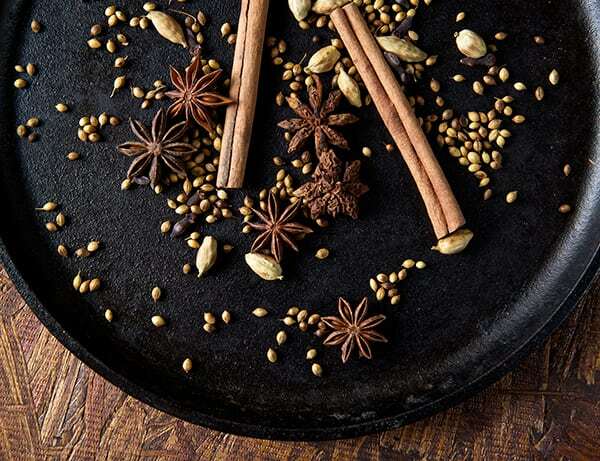 Toast your spices, star anise, coriander, cinnamon sticks, cloves, cardamom pods, pepper until they start to release their aromas. 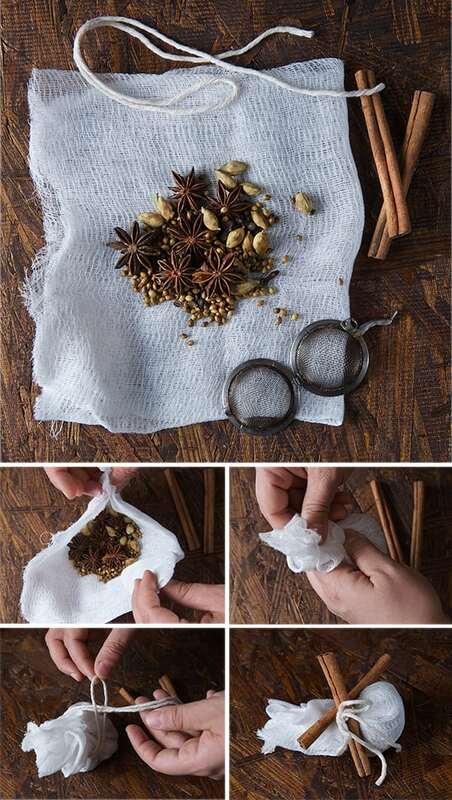 Using a piece of cheese cloth, a linen bag or a large tea ball, make a pouch and attach this to the pot making sure the bag is immerse in the water. 3. Rinse chicken inside and out roughly with warm water. Pat it dry. 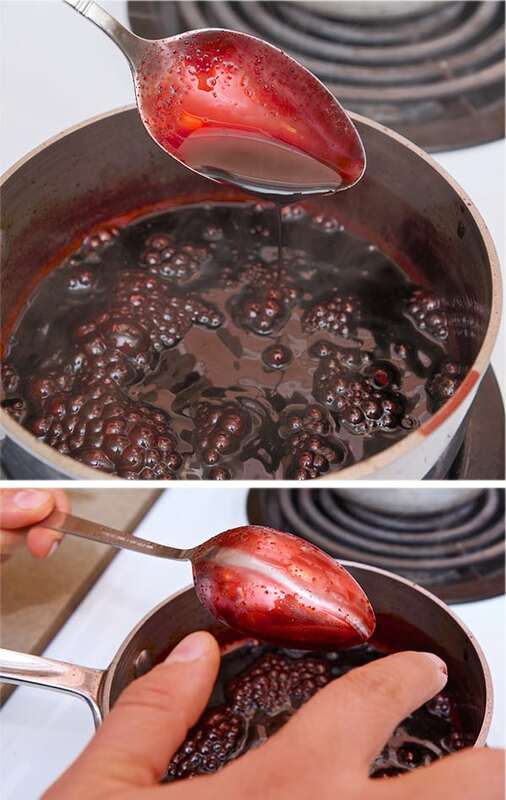 In a large pot add 4 quarts water. 4. If you are using the extra chicken parts, par boil them in a separate pot for about 15 minutes. At this point toss the water, rinse the chicken parts and add them to the main pot along with the whole chicken. Bring to a slow simmer and simmer uncovered for about 25 minutes. Using a ladle remove any extra foam that might form from the chicken broth. Once that the broth is cleared, cover and simmer for at least 15more minutes. 5. Short Alternative: There are a lot of good quality organic chicken broths available at the super markets. If you prefer to use something already made my only suggestion would be to buy organic and no-salt added or low sodium so you can control the amount of salt in your broth If you are using this route , just add the 32oz. jug of chicken broth to the main chicken and water pot. 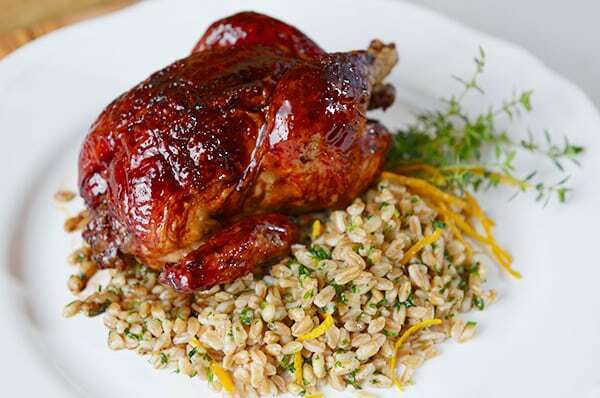 Bring to a slow simmer with the whole chicken, the pouch of spices, the charred onions and ginger. Simmer uncovered for about 25 minutes. Using a ladle remove any extra foam that might form from the chicken broth. Once that the broth is cleared, cover and simmer for at least 15 more minutes. 6. At this point, the chicken is cooked it should feel firm and juicy. 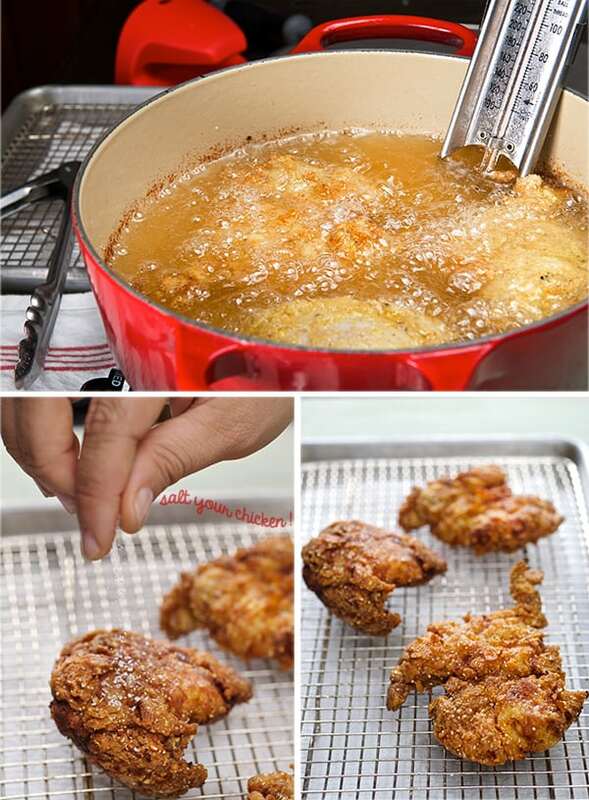 Use a pair of tongs to grab the chicken and transfer it to a large bowl. Rinse the chicken with cold water and drain well. Cover and set aside for 15 to 20 minutes until it is cool enough to handle. Meanwhile, keep the broth at a steady simmer. 7. When the chicken is cool enough to handle remove all the breast meat, leg and thighs keep the flesh in big pieces so it does not dry out, cover with plastic wrap, refrigerate. And remember to bring it to room temperature before assembling your noodle bowl. 8. Return carcass and all other attached parts to the stock pot and keeping in it under slow simmer. Cook the broth for at least one more hour. Adjust salt. 9. Strain the broth through a fine mesh sieve, discard the solids. Use a ladle to skim the broth if it has to much extra fat. Usually if you are using an organic chicken the fat content is way lower than chickens that had been in a faster grow diet. 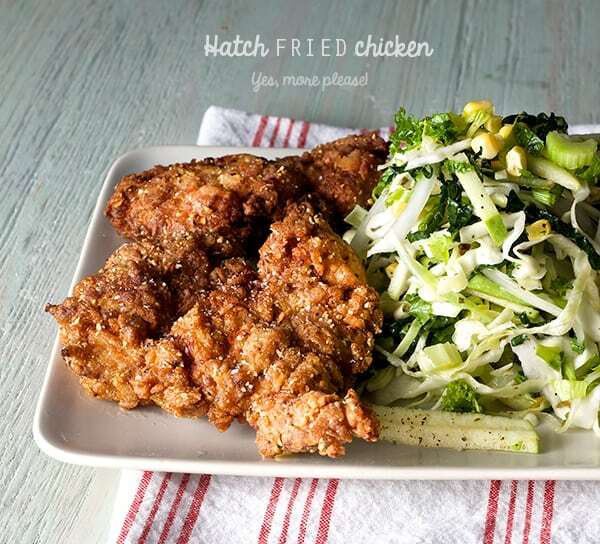 That’s why I will 100% recommend you to use an organic chicken which have less fat and stellar flavor! Return the broth to the stock pot and keep it at a slow simmer. At this point you should have about 4qts to 16 cups of broth left. The broth should look translucent amber color, glistening and a bit saltier to compensate and balance the saltiness when you add the noodles. 10. Slice, chop, rise and dry your herbs and garnishes, place them in little side dishes on the table so everybody can customize their soup. 1. For dried noodles: cover them with hot tap water and let soak for 15 to 20 minutes, or until they are pliable and opaque. Drain in a colander. For fresh rice noodles: untangle them, place in a colander, and rinse briefly under cold running water. 2. Slice or shred the chicken removing the meat from the leg bones, remove the skin. Set aside. 3. Warm your bowls in the oven at a low temperature make sure your bowls are oven safe. 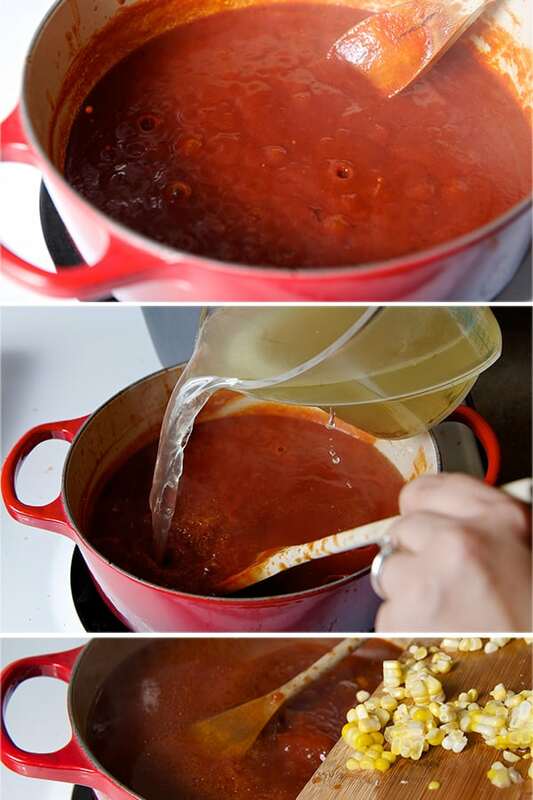 This is an extra step, but very important if its cold and you want your soup to stay warm longer when its served. I love my white authentic ceramic pho bowls they keep my soup warm! 5. In a warm bowl place the blanched, strained, noodles, top with slices of chicken, sprinkle some green onions, finely sliced yellow onions or shallots, crack some fresh pepper. Add 2-3 ladles of the simmering hot broth or until the broth covers the noodles. Serve immediately and top with the extra garnishes at the table. 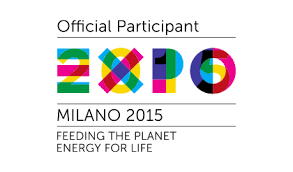 Enjoy!!! I think as I get to know more people from different backgrounds, cities, expatriates, cultures, beliefs, culinary eccentrics, purist, creators; the more I conclude that authenticity is not a place, a language, a heritage, a culture, or a belief. I think authenticity comes from within. Who you are at this right moment, in this place and at this time; and the one that you want to become…. that’s authenticity for me. “… because you are more authentic the more you resemble what you’ve dreamed of being” – “La Agrado’s” monologue (All About My Mother) Almodovar. In the culinary world, I’ve always questioned myself about what is considered an authentic dish? Perhaps it is the dish that resembles more to the people who created it? 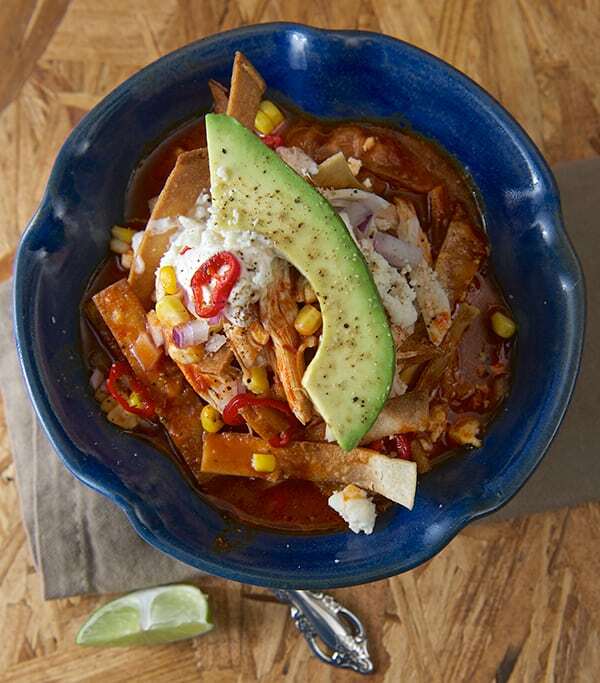 For example, If you are from Mexico; is the soup that your grandma prepares more authentic, than my grandma’s soup?.. No, I really don’t think so. 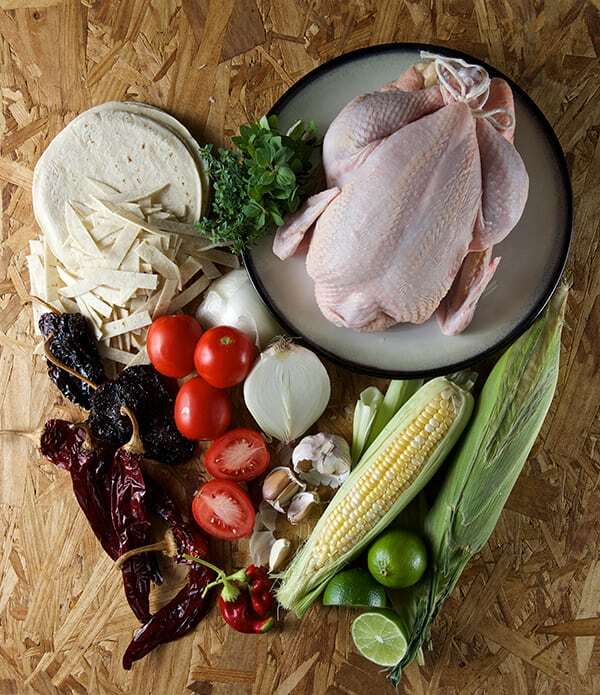 I believe you embrace the flavors that make you happy and satisfy, that make you re- create a memory a flavor, an aroma and you create the soup you want to eat and share with your loved ones… It will be hard to imagine Mexican grandmas cooking for the authenticity sake! 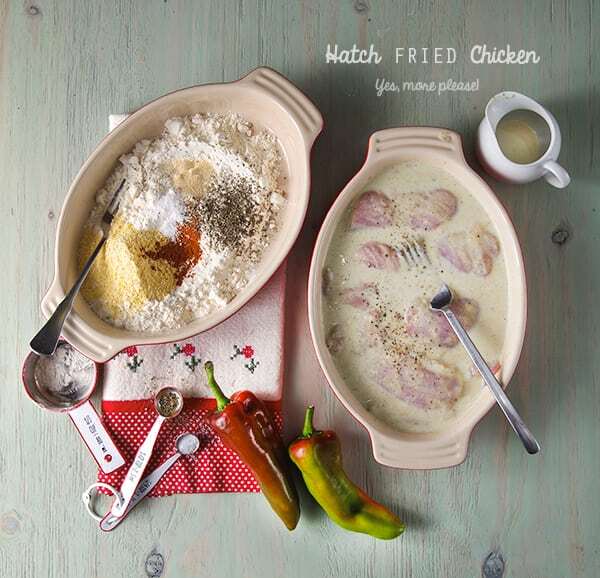 I believe you can cook along the way with tradition and make it your own with a few touches. I hope you like the soup as much as I do. So let’s cook!. Enjoy. 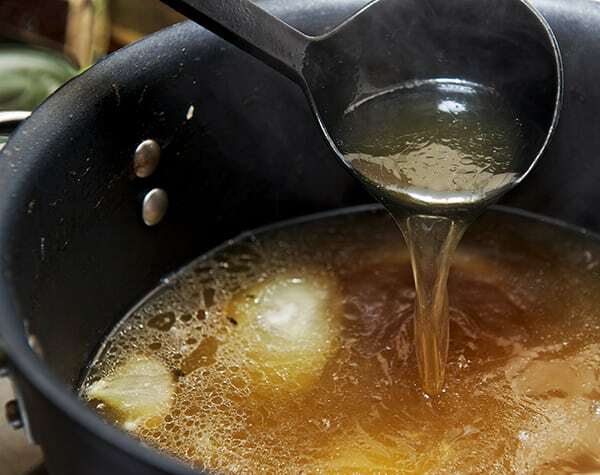 4-5 cups Chicken stock previously made… or the best option you have available. 8-10 Corn Tortillas cut into 1/2-1/4” wide strips. 1. Start by preparing your chicken stock on a 7-8 qt pot. Place the whole chicken and add all the stock ingredients, add water enough to cover the chicken. Bring to boil and then lower down the heat to a slow simmer cover with a lid and cook for about 45 minutes. 2. 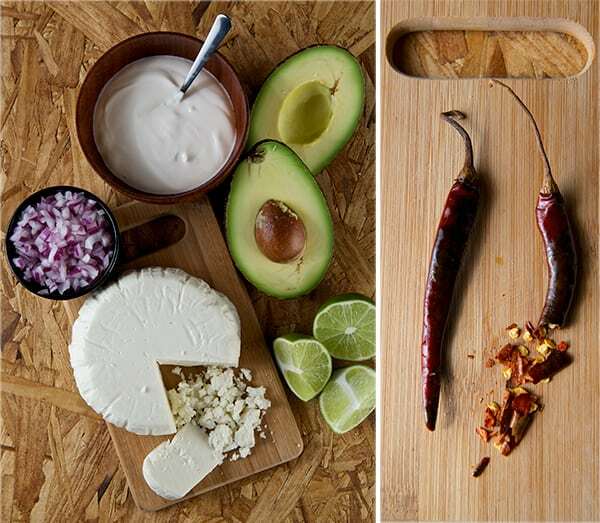 Mean time slightly toast your chillies on a pan, small comal or cast iron pan. 3. In a small pot boil the toasted chillies and the tomatoes. 4. Once they are soft, place the chillies, tomatoes, onion & garlic into a blender or food processor and puree. 6. Cut and Fry the tortilla strips. Once fried place them on a plate with a paper towel to remove the oil excess. Sprinkle with salt while they’re warm. 7. Check on your chicken stock, the broth should look translucent, no foam on the top, vegetables soft and onion translucent, chicken fork tender. If it is done remove at least 4 cups of chicken stock and strain. Take out the chicken, place it on a bowl and cover with some aluminum foil wait a bit until ready to handle, remove the skin and shred the chicken. 8. 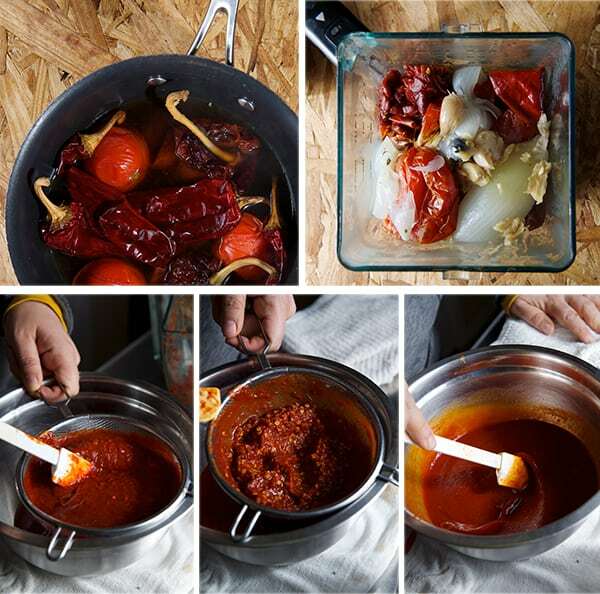 In a medium size pot add 4 tablespoon of canola, or sunflower oil, once is rippling hot add your chilli-tomato puree, and cook the sauce in medium low for about 4-5 minutes. 9. 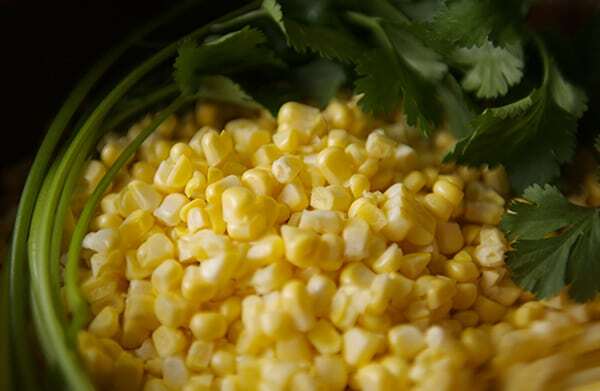 Add chicken stock, and corn kernels season with salt and simmer for about 10-15 minutes. 10. Taste the soup for salt and paper. 12. 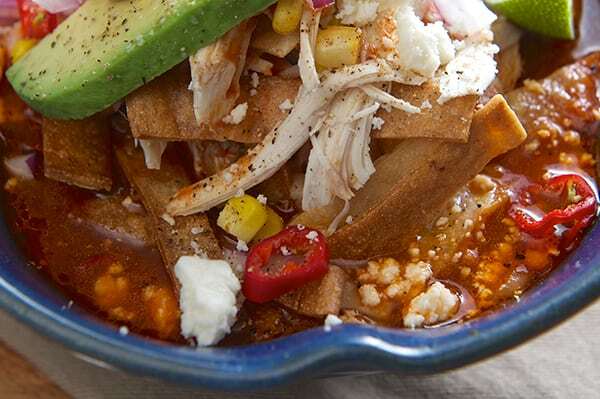 Serve on a deep bowl place the shredded chicken 2 to 3 ladles of the chilli broth place a good handful of the fried tortilla strips, and garnish with the cream, crumble cheese, avocados, and some of the chile de arbol fresh or toasted with a little oil for more heat. I’m in love with the chickens from Smith & Smith Farms, it is a small family operated farm, they specialize in pasture raised meats that are hormone and antibiotic free. They raise Dorper Lambs, all different breeds of laying hens, Cornish Rock meat chickens, Red wattle hogs, and Broad Breasted White Turkeys. All of the animals on their farm are free range and roam around every where! They are all as happy as can be, and you can taste the happines when you cook them. Delicious!